I'm contemplating hosting an Easter brunch this year - just for my parents and maybe a few others without family around they're spending the holiday with. 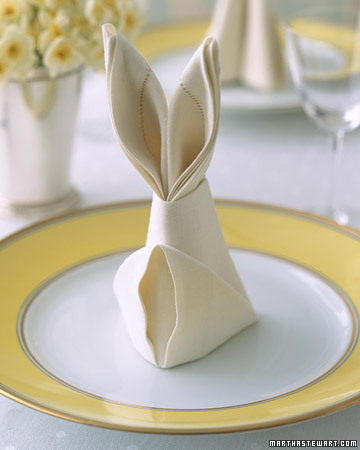 Martha is my go-to girl for menu and entertaining inspiration, and I just had to share this napkin folding technique! I think it's an elegant way to incorporate the holiday into your table decor without having to add grass, furry bunnies and eggs. What are your go-to dishes for Easter? Please share and help a sista out!